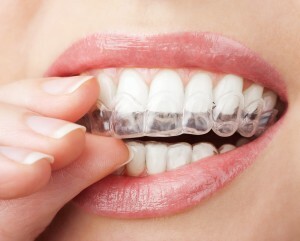 Invisalign Clear Braces: Get the Smile You’ve Always Wanted! Your smile is among your greatest assets, conveying confidence, charisma, charm, and emotion in a mere instant. If you are an adult or an adolescent with crooked, gapped, or crowded teeth, you may find yourself wishing that there was an easy, affordable way to correct your smile. While traditional orthodontic treatment does prove a good fit for many people, it simply isn’t the right solution for everyone. At Cosmetic & Family Dentistry in Weatherford, TX, Dr. Deborah A. Romack and Dr. Garrett Mulkey offer a variety of cosmetic dentistry solutions for smiles of all shapes and sizes, including Invisalign clear aligners. Invisalign clear braces are BPA-free, acrylic aligners that are customized to fit your unique dentition precisely, gradually straightening your teeth over the course of your treatment. The duration of your treatment will depend on the beginning state of your alignment, but most patients wear their aligners for approximately 8 to 18 months. Patients who want to avoid bulky metal brackets and wires love how natural Invisalign aligners look and feel, as well as how easy it is to remove them when necessary to eat and clean their teeth. After an initial consultation with our doctors, impressions of your teeth will be taken and sent to the Invisalign lab so that your aligners can be custom-crafted just for you. You’ll simply wear each set of aligners for about two weeks before moving on to the next. Routine visits to our office will ensure that the system is working optimally. Before you know it, you’ll be showing off a perfectly aligned new smile to the world! Our experienced, compassionate team at Cosmetic & Family Dentistry in Weatherford believes that everyone deserves to enjoy the full benefits that come with a beautiful, healthy smile. We invite you to contact our office today to schedule your consultation to see if Invisalign clear orthodontics are right for you. Our doctors and staff will happily work with you to determine which cosmetic procedure will best suit your unique needs. We also happily serve patients from throughout nearby communities, including Mineral Wells, Millsap, Aledo, Springtown, Brock, and more.